Mitsubishi Materials is proud to announce BC8110 Coated CBN Grade for High Hardened Steel Turning. Longer tool life with PVD coated cBN grade when turning hardened steels. Coated with a new TiAlSiN technology for excellent wear resistance. 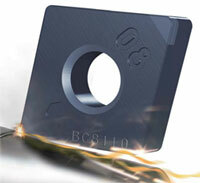 Covers the wide application range for continuous cutting of steel. A variety of hones to maximize efficiency and tool life performance.